The fact that Windows Phone is far, far behind the likes of iOS and Android in terms of numbers of apps is one thing, but the fact that many "core" apps are missing only serves to amplify the problem. 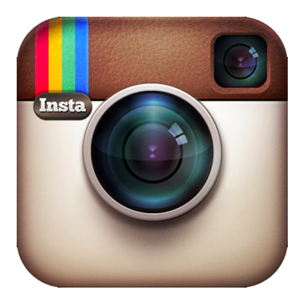 Instagram is one app which, for some, has hindered potential migration from the aforementioned big two platforms, and love or loathe the filter-laden network, its popularity is undeniable. 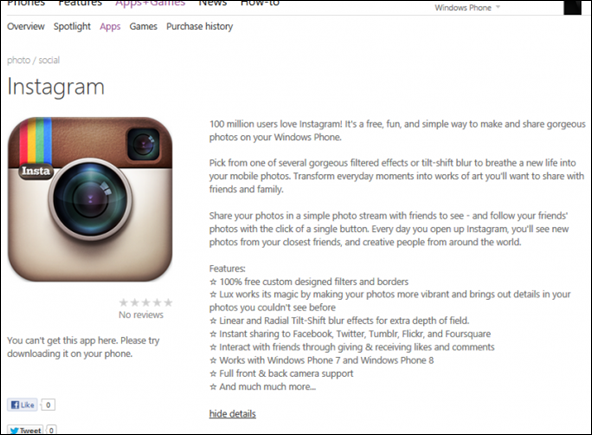 For Windows Phone to take a decent cut of the market share, apps such as Instagram will need to materialize sooner rather than later, and whether it be wishful thinking or a legitimate claim, a screenshot has emerged depicting the Facebook-owned app on the Windows Phone Store. 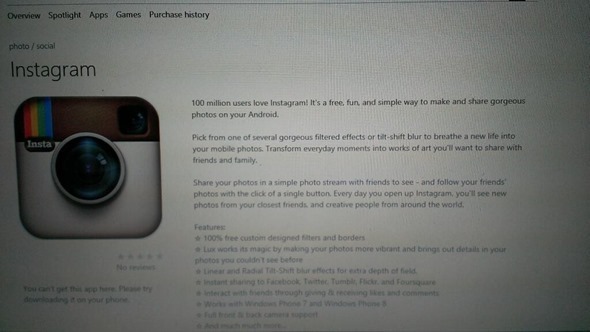 To superimpose the app page from another store would not require grade A Photoshop skills, and the fact the opening sentence reads describes the app as "a simple way to make and share gorgeous photos on your Android", makes us skeptical about whether there’s any possibility that we could be on the cusp of Instagram for Windows Phone. The listing, which leaked early today via the Twitter handle anontechleaks, makes note of the fact that the app is not available to download, which means that, if it is indeed real, it is likely being tested internally. Also, with the page not supposed to be going public, the description could easily have just been pasted over from Google Play in order to bulk up the text and present a rough idea of how the app will eventually look. Interestingly, the app appears in the Photo > Social category; one which, at this point in time, doesn’t actually exist. Then again, it’s not as though the Windows Phone Store is exactly awash with Instagram-alike apps, so there’s no reason why the app couldn’t create its own category upon eventual release.